On March 30, 1908, Green Cottenham was arrested by the Shelby County, Ala., sheriff and charged with vagrancy. After three days in the county jail, the 22-year-old African-American was sentenced to an unspecified term of hard labor. The next day, he was handed over to a unit of U.S. Steel Corp. and put to work with hundreds of other convicts in the notorious Pratt Mines complex on the outskirts of Birmingham. Four months later, he was still at the coal mines when tuberculosis killed him. Born two decades after the end of slavery in America, Green Cottenham died a slave in all but name. The facts are dutifully entered in the handwritten registry of prisoners in Shelby County and in other state and local government records. In the early decades of the 20th century, tens of thousands of convicts — most of them, like Mr. Cottenham, indigent black men — were snared in a largely forgotten justice system rooted in racism and nurtured by economic expedience. Until nearly 1930, decades after most other Southern states had abolished similar programs, Alabama was providing convicts to businesses hungry for hands to work in farm fields, lumber camps, railroad construction gangs and, especially in later years, mines. For state and local officials, the incentive was money; many years, convict leasing was one of Alabama's largest sources of funding. Most of the convicts were charged with minor offenses or violations of "Black Code" statutes passed to reassert white control in the aftermath of the Civil War. 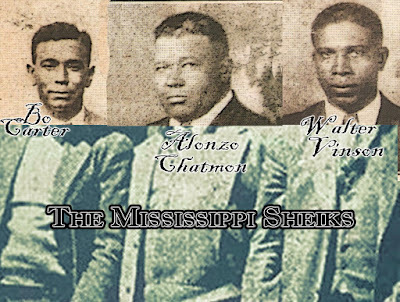 Mr. Cottenham was one of more than 40 Shelby County men shipped to the Pratt Mines in the winter of 1908, nearly half of them serving time for jumping a freight train, according to the Shelby County jail log. George Roberson was sent on a conviction for "assault with a stick," the log says. Lou William was in for adultery. John Jones for gambling. Subjected to squalid living conditions, poor medical treatment, scant food and frequent floggings, thousands died. Entries on a typical page from a 1918 state report on causes of death among leased convicts include: "Killed by Convict, Asphyxia from Explosion, Tuberculosis, Burned by Gas Explosion, Pneumonia, Shot by Foreman, Gangrenous Appendicitis, Paralysis." Mr. Cottenham was one of dozens of convicts who died at the Pratt Mines complex in 1908. This form of government and corporate forced labor ended in 1928 and slipped into the murk of history, discussed little outside the circles of sociologists and penal historians. But the story of Alabama's trade in human labor endures in minute detail in tens of thousands of pages of government records stored in archives, record rooms and courthouses across Alabama. These documents chronicle another chapter in the history of corporate involvement in racial abuses of the last century. A $4.5 billion fund set up by German corporations, after lawsuits and intense diplomatic pressure from the U.S. and others, began making payments last month to the victims of Nazi slave-labor programs during the 1930s and 1940s. Japanese manufacturers have come under criticism for their alleged use of forced labor during the same period. Swiss banks agreed in 1998 to a $1.25 billion settlement of claims related to the seizure of Jewish assets during the Holocaust. In the U.S., many companies — real-estate agents that helped maintain rigid housing segregation, insurers and other financial-services companies that red-lined minority areas as off-limits, employers of all stripes that discriminated in hiring —helped maintain traditions of segregation for a century after the end of the Civil War. But in the U.S., recurrent calls for reparations to the descendants of pre-Civil War slaves have made little headway. And there has been scant debate over compensating victims of 20th century racial abuses involving businesses. The biggest user of forced labor in Alabama at the turn of the century was Tennessee Coal, Iron & Railroad Co., the U.S. Steel unit that owned the mine where Mr. Cottenham died. Dozens of other companies used convicts, too, many of them now defunct or absorbed into larger businesses. Executives at some of the corporate descendants say they shouldn't be asked to bear responsibility for the actions of executives long dead or the practices of businesses acquired decades ago. U.S. Steel says it can find no evidence to suggest that the company ever abused or caused the deaths of convicts in Alabama. U.S. Steel spokesman Thomas R. Ferrall says that concerns voiced about convict leasing by Elbert H. Gary, the company's chairman at the time, helped set the stage for "knocking the props out from under" the system. "We think U.S. Steel proper was a positive player in this history . . . was a force for good," Mr. Ferrall says. The company's early presence in Alabama is still evident a few miles from downtown Birmingham. There, on a hill-side overgrown with brush, hundreds of sunken graves litter the ground in haphazard rows. A few plots bear stones. No other sign or path marks the place. Only a muddy scar in the earth — the recently filled-in mouth of a spent coal mine —suggests that this is the cemetery of the Pratt Mines complex. 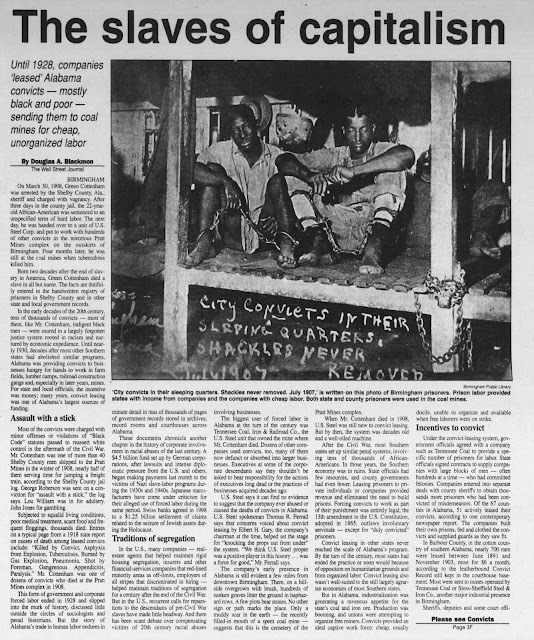 When Mr. Cottenham died in 1908, U.S. Steel was still new to convict leasing. But by then, the system was decades old and a well-oiled machine. After the Civil War, most Southern states set up similar penal systems, involving tens of thousands of African-Americans. In those years, the Southern economy was in ruins. State officials had few resources, and county governments had even fewer. Leasing prisoners to private individuals or companies provided revenue and eliminated the need to build prisons. Forcing convicts to work as part of their punishment was entirely legal; the 13th amendment to the U.S. Constitution, adopted in 1865, outlaws involuntary servitude — except for "duly convicted" prisoners. Convict leasing in other states never reached the scale of Alabama's program. By the turn of the century, most states had ended the practice or soon would because of opposition on humanitarian grounds and from organized labor. Convict leasing also wasn't well-suited to the still largely agrarian economies of most Southern states. But in Alabama, industrialization was generating a ravenous appetite for the state's coal and iron ore. Production was booming, and unions were attempting to organize free miners. Convicts provided an ideal captive work force: cheap, usually docile, unable to organize and available when free laborers went on strike. 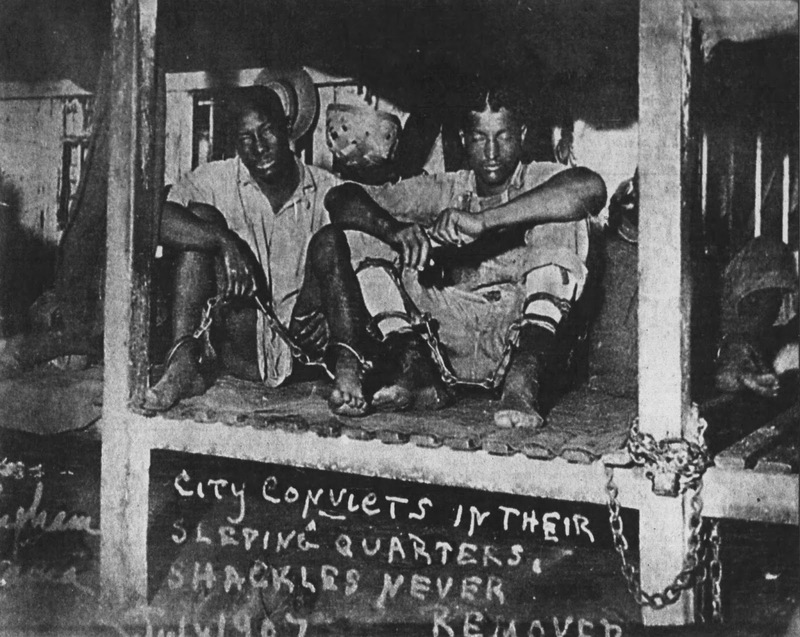 Under the convict-leasing system, government officials agreed with a company such as Tennessee Coal to provide a specific number of prisoners for labor. State officials signed contracts to supply companies with large blocks of men — often hundreds at a time — who had committed felonies. Companies entered into separate deals with county sheriffs to obtain thou-sands more prisoners who had been convicted of misdemeanors. Of the 67 counties in Alabama, 51 actively leased their convicts, according to one contemporary newspaper report. The companies built their own prisons, fed and clothed the convicts and supplied guards as they saw fit.